A meniscus is basically the shock absorber of the knee. Normally, we are each born with two menisci in each knee. One is situated toward the inside aspect of the knee and is called the medial meniscus. The other is located on the outside aspect of the knee and is called the lateral meniscus. These have been described as C-shaped or semi-lunar. They are only a few millimeters thick and have a rubber-like consistency. This helps them to absorb the shock of weight going across the knee joint during impact activities such as running and jumping and also non-impact activities such as walking, climbing and squatting. Complete excision of a meniscus leads to increased stress being transmitted to the ends of the femur (thigh bone) and tibia (shin bone) as those bones articulate against each other at the knee joint. The resulting increased stress on the surface of these bones is thought to predispose them to wear out prematurely leading to degenerative arthritis (also called osteoarthritis). Although important, a meniscus can tear and then become painful. Sometimes it can tear in a way that produces a flap of tissue, which displaces and can actually be a block to motion of the knee. This can cause the knee joint to lock in one position, and can be extremely painful. Many years ago, we did not have arthroscopic surgical techniques to address this problem, and open surgery was the only option. This typically resulted in the excision of the entire meniscus, not just the torn part. Subsequently, many people started developing degenerative arthritis of that knee years to decades after having their entire meniscus excised. 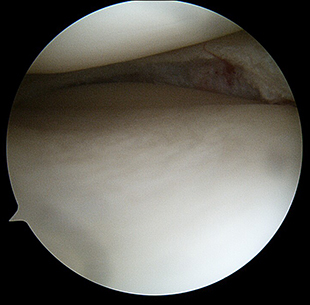 With arthroscopic procedures, visualization and access to the meniscus is much improved over the traditional open surgical approach. As a result, only the torn portion of the meniscus need be excised, leaving the remaining functioning meniscus in place. This greatly decreases the loss of function of the meniscus compared to the open surgical approach. It is important to realize that the torn part of the meniscus is not functioning anyway, yet causing symptoms. Arthroscopic removal of the torn part will not result is restoration of function, but it will lead to decreased symptoms, usually allowing return to normal activity. Why not repair the torn meniscus? The meniscus actually has a very poor blood supply. As a result, most repairs will not heal and continue to cause problems. A small percentage of meniscal tears do maintain adequate blood supply, and attempts can be made to repair them, with a high degree of success. As mentioned above, only a certain percentage of menisci are going to heal if we repair them. In fact, only 10-15% of all meniscal tears fall into this category. Although the meniscus may be saved, recovery from meniscal repairs is a lot slower than recovery from partial meniscal excision. If the meniscus is partially excised, there really is no repair to protect. Therefore, as the swelling and stiffness associated with surgical intervention diminish, one may begin to return to normal activity. On the other hand, if a meniscus tear is repaired, we have to protect that repair until the meniscus heals. This typically takes 3 to 4 months. During this time there are restrictions placed on activity. Because of this, return to normal function after a meniscal repair operation is much slower than after partial meniscal excision. What if one loses an entire meniscus? 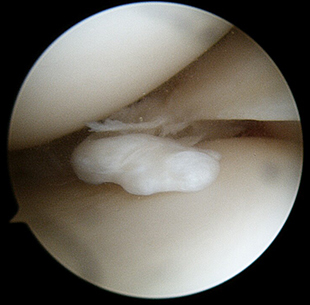 A massive irreparable meniscal tear can lead to loss of the entire meniscus. Fortunately, technology has advanced to the point of allowing us to perform meniscal transplantations. In this procedure, a cadaveric meniscus is transplanted into a knee lacking that structure. Only certain knees are candidates for this promising technique, however. Dr. Ilahi is one of only a handful of surgeons in the Houston area with experience in this technically demanding operation.